One thing New Orleanians can agree on, the po-boy satisfies hunger like nothing else. The once-humble sandwich has gone high-class in recent years, with top chefs serving their own inventive takes. But you can still find hearty 12-inch versions spilling fried shrimp and oysters for under $15 in local corner stores. 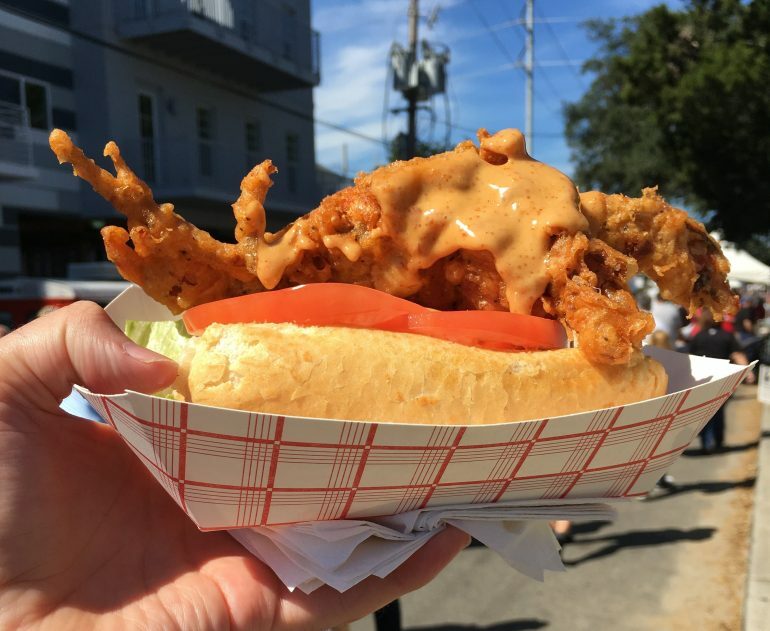 There will be a po-boy for every budget and palate in New Orleans at the Oak Street Po-Boy Festival on Sunday, November 11, 2018. You will be able to sample the best po-boys the city has to offer. The fest will be held between the 8100 and 8800 blocks of Oak Street in the Carrollton neighborhood, 10 a.m. to 6 p.m. About 35 vendors will present more food that you could shake your fork at, with over 50 varieties of the delicious sandwich alone — plus beer, specialty cocktails, and desserts. Jared Zeller, founder and producer of the annual Mid-City Bayou Boogaloo, will produce this year’s festival. Son of a Saint is 2018’s non-profit partner and festival beneficiary. The Where Y’Art Market and four music stages return this year. Musical headliner is The George Porter Trio, with the local musical treasure and founding member of The Meters, funkmaster George Porter, at the helm. Morning 40 Federation and Soul Brass Band are also scheduled to perform. Like last year, admission is free, but you have to get a $5 wristband at the fest to purchase the po-boys (it’s OK if one person in the group buys multiple po-boys, according to the event organizers). Hate the long lines? This year attendees can get their hands on the po-boys faster by getting one of the two passes. One option is a $20 “fast pass” to enter through the fast lane. The VIP pass ($99) grants access to the Mellow Mushroom on Oak VIP lounge and balcony and the front-row view of the main stage. There you’ll find unlimited Urban South Brewery beer, plus food from the Parkway Bakery and Tavern and other vendors, and specialty cocktails. Just like in the past years, some of the best restaurants in the city will once again compete in several “Best of” categories. Past winners included Red Fish Grill’s BBQ oyster po-boy and Bratz Y’all’s Drunk Pig. To give you just a taste of what to expect, the Mid-City-based po-boy king Parkway Bakery and Tavern will bring one of its wildly popular signature creations, the Parkway Surf and Turf — slow-cooked roast beef topped with fried Gulf shrimp and smothered in gravy. The ever popular Godfather po-boy from Vincent’s Italian Cuisine marries three savory meats: Italian sausage, meatballs and daube meat (beef slow-cooked in a red sauce, like a brisket) and tops them with mozzarella cheese. Redfish Grill will again offer its signature BBQ oyster concoction, flash-fried and tossed in Crystal BBQ sauce. And Metairie’s NOLA Boils & Catering kicks it up with an escargot po-boy. In the dessert category, new this year is the Po-Boy Ice Cream Sandwich from the New Orleans Ice Cream Company. And Urban South Brewery will create a special Po-Boy lager for the festival.